Washington, D.C. - October 22, 2009 - Thursday was another exciting day of competition at the 2009 Washington International Horse Show (WIHS), as the schedule featured four jumper classes for amateur-owner, junior, and open jumpers. The highlight class of the day was the $30,000 Open Jumper Time First Jump-off class, and Olympic gold medalist McLain Ward (USA) took the top prize on Couletto K James. Andres Rodriguez (VEN) and Da Vinci were victorious in the $20,000 Open Jumper Gambler’s Choice Costume class, presented by Honeywell International, Inc. This week’s courses are designed by Guilherme Jorge of Brazil. Earlier in the day, Lillian Hahn won the Amateur-Owner Time First Round on Lucky One, and Navona Gallegos on Drossana took first place in the opening Junior Jumper Time First Jump-off class. In the $30,000 Open Jumper class, 30 horses went to post in the first round. There were six clear rounds that returned for the jump-off, with the first horse in the ring setting the pace. Rodrigo Pessoa (BRA) and new mount Night Train, owned by Double H Farm, were double clear and stopped the timers in the jump-off in 30.45 seconds. Next in, Hillary Dobbs (USA) and Quincy B had a fast time of 31.17 seconds, but a rail put them into fourth place at the end of the class. Jill Henselwood of Canada’s silver medal Olympic team followed with Bottom Line, owned by Bradon Construction. They were clear in 32.44 seconds to finish third. 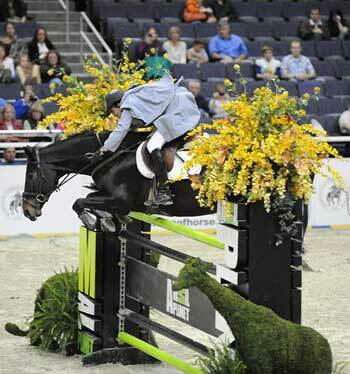 Ireland’s Shane Sweetnam on Zamiro, owned by Spy Coast Farm LLC, had eight faults in 32.00 seconds for sixth place. The eventual winner, Ward and Couletto K James, owned by Katie Dinan LLC, were able to leave strides out, thanks to the horse’s large stride, and a sharp turn to the final vertical helped them bring the winning time down to 29.42 seconds for the win. The final pair in the class, Marilyn Little-Meredith and Raylyn Farms Inc.’s Ragrusa H, had eight faults in 30.48 seconds for fifth place. For his win tonight, Ward was presented with the Ben O’Meara Memorial Challenge Trophy. The last class of the night was the entertaining costume class for the $20,000 Open Jumper Gambler’s Choice. 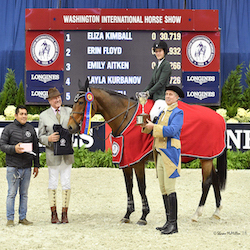 While quite a few riders had a chance to catch the winning point total, it was Andres Rodriguez dressed as Sherlock Holmes and the seven-year-old Oldenburg gelding Da Vinci that scored the highest amount of points with the fastest time. Their clear jump over the Joker fence raised their total to 1400 points, and their time of 56.31 seconds gave them the win. Margie Engle (USA) and Hidden Creek’s Pamina L (57.60 seconds) and Todd Minikus (USA) on Olinda (59.43 seconds) finished second and third. As the winning rider, Rodriguez was given the Crown Royal Trophy, donated by Crown Royal, and the Sue Ann Geisler Memorial Trophy, donated by the WIHS, for his winning horse. A $2,500 Amateur-Owner Jumper class began the jumper competition this afternoon with the win going to Lillian Hahn and Lucky One. The class was held in a Timed First Round format, and Hahn and Lucky One had the fastest of only three clear rounds to take top honors with a time of 59.400 seconds. Benjamin Simpkins and Astro Z earned second place after jumping clear in 64.404 seconds. The third place award went to Marley Goodman and U-2 with the only other clear round in a time of 70.736 seconds. Hahn was honored as well, with the Cover Story Perpetual Trophy, donated by Rolling Acres Farm. The next class of the afternoon was the $2,500 Junior Jumpers with the winning round going to Navona Gallegos and Drossana. Six of the original 20 entries in the class went clear to jump-off, and Gallegos and Drossana had the faster of two clear jump-off rounds in a time of 39.072 seconds for the victory. 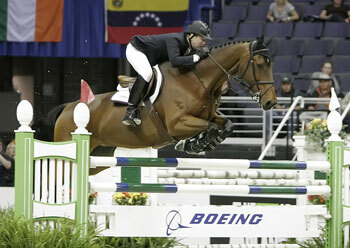 Reed Kessler and Flight earned the second place honors with their clear jump-off round in 39.805 seconds. Third place was awarded to Samantha Harrison and Santika with the fastest four-fault round in 39.424 seconds. “My jump-off strategy was basically to gallop,” she continued. “There was so much space in between one and two, and the second to last two jumps. I decided to gallop and go around instead of trying to slow down and fit it in before the turn.” Gallegos was presented with the Eleanor White O’Leary Memorial Perpetual Trophy, donated by Mr. and Mrs. Robert Ashton Hill and Miss Linden Joan Hill. Final Results: $20,000 Open Jumper Gambler’s Choice, presented by Honeywell International, Inc.
McLain Ward and Couletto K James won the $30,000 Open Jumper Time First Jump-off class. Photo © 2009 Jennifer Wood/PMG.